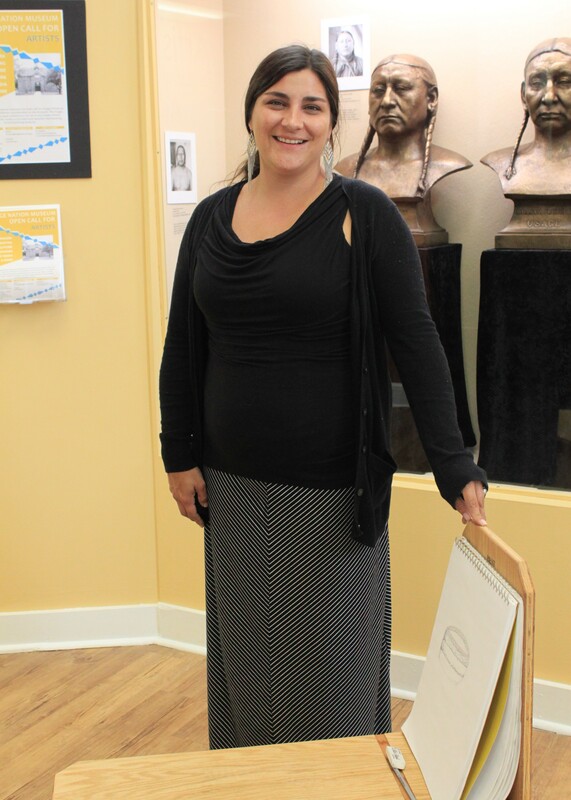 Curator Hallie Winter, who became the museum’s curator in May 2016, spoke to Pawhuska People about the updates she and Collections Manager, Callie Martin, are making at the Osage Nation Museum. Describing her vision, Curator Hallie Winter said: “What we wanted to do was make the place more warm and inviting and feel like home. That had a lot to do with our color choices for the walls. Some lighting and fire system improvements have also been made. “We’re getting new LED track lighting; there is a new fire suppression system, not utilizing water; it doesn’t remove all the oxygen, so it’s still safe, less harmful to the art and a lot better than water,” Winter explained. Display cases have gotten a facelift as well. 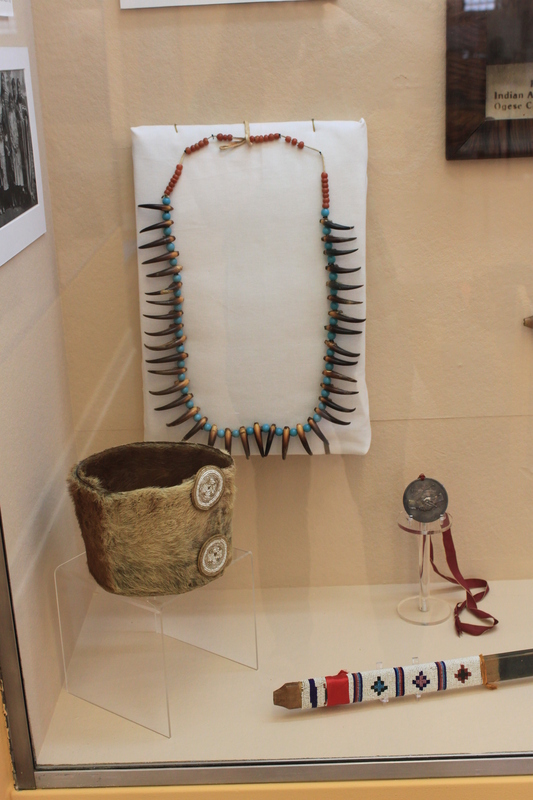 In the main gallery is what she described as a semi-permanent exhibit, which beautifully tells Osage history chronologically through artifacts, text and photos. “It’s is a loose timeline of Osage history. The objects will change periodically for object safe-keeping and to give them a rest … and bring out new ones. “We start with the origin story in this corner,” Winter said, pointing to the northeast corner of the main gallery. A print of the mural showing Osages descending to earth and landing is part of the display. The original mural is located at the Osage Congress, located just south of the museum. Maps are an important part of telling the Osage history story. “Then we move to our ancestor lands in pre-history. This shows our migration patterns,” Winter said. Winter pointed out the time period from 500 to 900 A.D.
“Those are different routes we took and then you can see as it goes down after 1350, when we were in the Missouri River Valley; then we started moving out. The Osage Historic Preservation Department has been working really hard on this. The information for these maps comes from them. They keep adding to it as they are making more discoveries,” Winter explained. The orange portion of one of the maps shows Osage ancestral territory. The map shows as far east as Pennsylvania and north into Illinois. 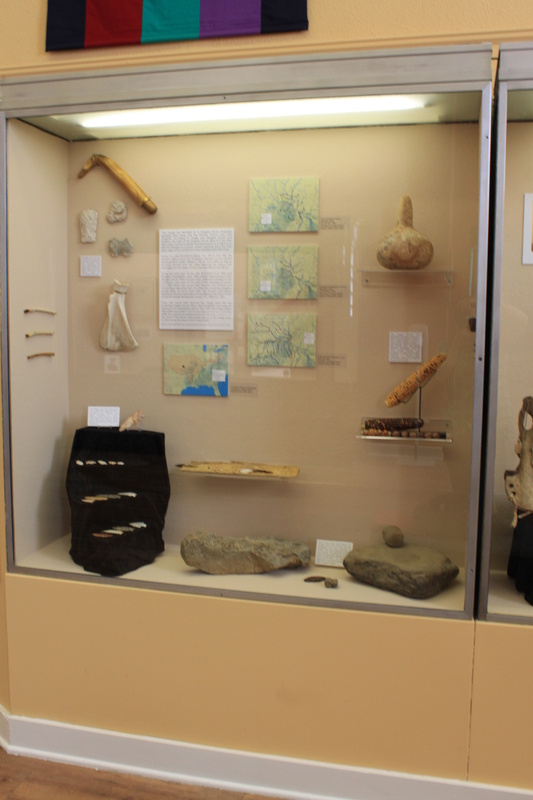 When the display describes contact with Westerners, artifacts that resulted from trade are featured. “We tell the story of when the explorers first came into contact with the Osage and what happened as a result of that, which is trade; so we have trade tokens, early trade beads and metal products. We have a photo of one of the first trading stores in Osage County in Fairfax. Museum guests are encouraged to share what they know about photos and displayed items, Winter added. “We are still fine tuning the information. People come in, they may know information and that’s been really helpful,” Winter said. 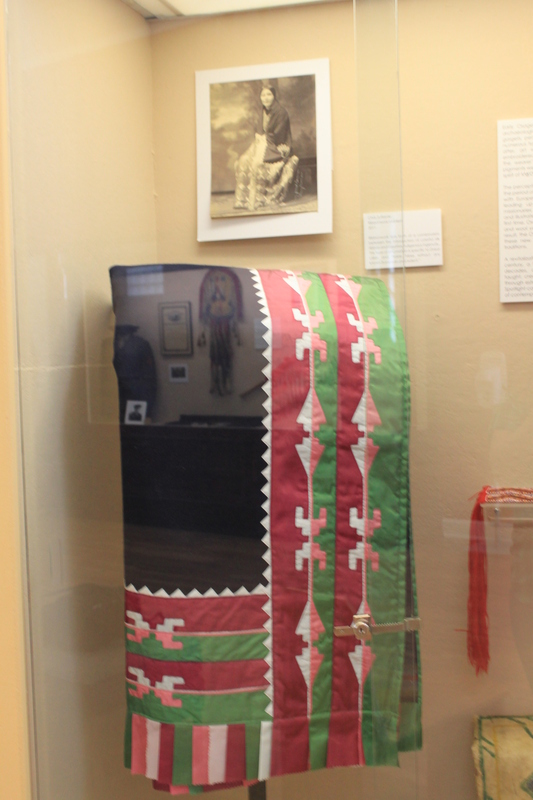 One case showcases Osage art and traditional forms of artwork. “We have a little bit of everything: ribbon work, finger weaving, moccasins, designs on old parfleches.” Parfleches are bags made of different materials, such as bison hide, Winter explained. There is a display case devoted to describing what Osages did with the wealth derived from the Osage oil and gas estate. International travel became an Osage leisure pastime. Next, was a display describing Osage treaties. “When we were doing treaties, we would pass the pipe. When we travelled to Washington D.C., we’d dress in our finest,” Winter explained. “In a lot of the treaties, the government was supposed to give us tools for farming as a condition,” Winter said. The government display case “tells a little about the Osage government and how it’s evolved over the past few hundred years,” Winter said. Part II of the Winter Interview Coming Soon!